Breeder of JRTCA registered terriers. Kennel history, photographs of their dogs, and links. Columbia, South Carolina. Online resource for Quarter Horse-related referrals and equine education. Sponsored by the American Quarter Horse Association (AQHA). Site includes information about finding and selecting the right horse, breeder referral, trainer referral, and tips for purchasing your first horse. Contains a horse show check list, photos and horse rescue information with extensive links. Includes a heart rending story of her first horse Tucker. The Friesian Horse Society, Inc., - FHS - is a non-profit organization whose mission is to both promote and preserve the beautiful Friesian horse through strict registration standards. FHS is the North American affiliate of the Friesian Horse Breeding Association in Germany, Friesenpferde-Zuchtverband e. V. - FPZV. AMHA/AMHR performance horse breeders. Known for their 4-horse hitch of red and white pintos. Offers photos, horses for sale, and links. AMHA/AMHR performance horse breeders. Known for their 4-horse hitch of red and white pintos. Offers photos, horses for sale, and links. Located in Utica. AMHA miniature horse breeders. Offering lots of photos, a sales page, cart training and links to horse other horse sites. Specializing in Pintos, from show quality to pets available. Chronicles the history of a unique horse stock, recorded with Agriculture Canada as the Block Horse pedigree. Trail rides, shows, trail maps, newsletter, messageboard, links to various horse clubs, horse and tack sales. Message boards for Washington, Idaho, Oregon and California horse owners to advertise and communicate with other horse owners in their area. Horse tack and training products including a collapsible horse bucket, medical kit for veterinary supplies, and storage for horse care and grooming supplies. Forums on horses and horse endeavors, including breed specific topics, riding styles, disciplines, and horse care. Horse raising, training, and sales. Includes sales list, photographs, and horse profiles. Open forum for those that would like to discuss the Sulphur Horse or any horse related topic. Directory of equine news, tips, horse shows, equine vet help, horse information, classifieds, and horse games. A fun and educational site for horse lovers of all ages. Includes information on horses, stories, poems, jokes, anatomy, clipart, horse cookie recipes, and screensavers. Horse pictures from authors ranch, local horse competitions, and wilderness trips. Arabian Horse World and Arabian Horse World Quarterly are equine publications devoted to news and information for owners, breeders and admirers of the Arabian horse. Regional horse industry webhosting site includes training, boarding, breeding, and lessons, arizona only horse classifieds, ask an expert, vets, shoers, and other horse-related businesses. Promoting good sportsmanship and horsemanship among stock horse owners and exhibitors in the area. Includes horse shows, stallion services, and horses for sale information. If the business hours of Shadowood Horse Pages in may vary on holidays like Valentine’s Day, Washington’s Birthday, St. Patrick’s Day, Easter, Easter eve and Mother’s day. We display standard opening hours and price ranges in our profile site. We recommend to check out lfrazer.com/horse.html for further information. 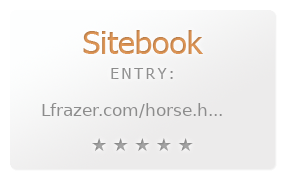 You can also search for Alternatives for lfrazer.com/horse.html on our Review Site Sitebook.org All trademarks are the property of their respective owners. If we should delete this entry, please send us a short E-Mail.